Hart dreamed he had a visual migraine aura and woke up with a migraine. My guess is it wasn’t just a dream, but he was seeing the aura while asleep. Since an aura originates in the brain, not in the eyes, this seems logical to me, but I can only find one article about it. Based on two case studies, the authors say that geometric patterns from visual auras can be incorporated into dreams. I assume that dreaming you have an aura is a literal, direct incorporation into the dream, rather than the more abstract idea the article mentioned. I’m really curious about this and can’t test it out on myself (since I have, fortunately, not had an aura outside of that terrible weekend). I have vivid dreams and nightmares during migraine attacks, but don’t think they usually precede attacks, and I don’t have a visual aura at all. So I’m crowdsourcing. Do you have auras in your sleep, either like the typical visual auras you get when awake or bad dreams? 2. My migraine attack frequency is: I am almost never without some hint of migraine, from the shimmering lights, tingling and numbness or ringing ears that signal its beginning, to the exhaustion that tail behind. 3. 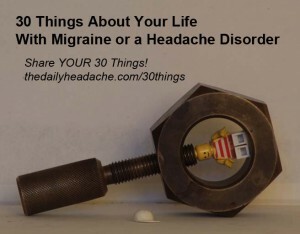 I was diagnosed in: I was first diagnosed with Basilar Type Migraine in 2007. At that time my migraine was episodic in nature. I was diagnosed with chronic migraine in 2014, although I think my migraine began transforming from episodic to chronic in 2010. 4. My comorbid conditions include: Fibromyalgia, Chronic Fatigue Syndrome, GERD, IBS and Anxiety. 5. I take 10 medications/supplements each day for prevention and 5 medications/supplements to treat an acute attack. I also receive botox treatments for prevention that involve 32 injections to the face and neck. During an acute attack, I often need intramuscular injections of toradol, which I am currently not able to obtain from local pharmacies. The shortage of this medication has impacted my quality of life significantly. I am not able to access the single most successful acute migraine treatment, a class of drugs called triptans because the neurological symptoms I experience make it dangerous to take them. As a result I sometimes receive nerve blocks, which require injections of steroid and analgesic to my head and neck in a similar pattern to the botox (over 30 injections). When my migraines are most extreme I require a 3-5 day IV infusion “cocktail” including magnesium, steroids, toradol, a medication to control nausea and benedryl in order to return to my typical levels of pain. I never expected to be a home healthcare patient at 27. 6. My first migraine attack was: My first full blown attack occurred at 18. It was absolutely terrifying. Looking back though, I believe that I experienced abdominal migraine during childhood, as I often experienced intense stomach pain and vomited without reason. I still have have GI issues, but they currently present as GERD and IBS. 7. My most disabling migraine symptoms are: Visual aura/Vertigo that occurs even when I am relatively pain free. This makes it difficult to complete simple daily tasks such as driving safely. 8. My strangest migraine symptoms are: Numbness & Tingling, & Persistent weakness on the right side of my body. MS runs in my family, and I had to have several diagnostic tests to ensure this was migraine related and NOT multiple sclerosis. 10. I know a migraine attack is coming on when: My neck hurts and I am seeing shimmering lights. Either one of these things independently could just be a part of how I live my daily life, but if both occur, I am going to need to lay low. 11. The most frustrating part about having a migraine attack is: the time it robs from me. I really would prefer to be productive in the traditional sense. 12. During a migraine attack, I worry most about: What I should be doing that I am not accomplishing. 13. When I think about migraine between attacks, I think: I spend a lot of time thinking about what I can do to improve my overall health and prevent the next lurking attack. 14. When I tell someone I have migraine, the response is usually: “I’m sorry.” Still, I’m not sure most people fully understand the impact that migraine can have on someone’s life when it is chronic. It has had a major impact on my life and my husband’s l(it robs him of so much too). 15. When someone tells me they have migraine, I think: This is someone who understands my pain. 16. When I see commercials about migraine treatments, I think: If only it were that simple. 18. I find comfort in: distractions such as good books and good TV and movies when I am feeling well enough to engage with them. 19. I get angry when people say: “You’re too young to be sick” or “I know someone who used to have migraines until they gave up cheese or chocolate or wine” I know they mean well, but it is so frustrating after years of researching and trying just about every migraine specific diet I can find! 20. I like it when people say: I see how hard you’re working to keep up. I’m not sure this is always easy to see, but its almost always the case. 21. Something kind someone can do for me during a migraine attack is: Offer to help with something that needs to get done. 22. The best thing(s) a doctor has ever said to me about migraine is: Your symptoms are real; I believe you. Let’s work on creating a treatment plan that will reduce the severity and frequency of your pain. 23. The hardest thing to accept about having migraine is: It has no cure. Migraine can be managed effectively, although I’m not there yet. I continue to strive for that, but still it will always be a part of my life. 24. Migraine has taught me: To drink in the days and even the moments when I feel well. I appreciate these times in a manner that I never would have otherwise. 25. The quotation, motto, mantra, or scripture that gets me through an attack is: Breathe. 26. If I could go back to the early days of my diagnosis, I would tell myself: FIND A HEADACHE SPECIALIST NOW. Do not pass go. Do not collect $200. Just do it, you will thank me later. 27. The people who support me most are: My husband, who is my greatest supporter and my coworkers who are incredibly understanding. 28. The thing I most wish people understood about migraine is: It can truly be disabling. Also, migraine with Aura can effect every part of the brain and present with nearly every neurological disturbance possible from visual changes, ringing in the ears, changes in sensation, to complete loss of consciousness and/or quadriplegia. 29. Migraine and Headache Awareness Month is important to me because: It is a chance to share my truth, and hopefully help others to understand a little bit more about the reality of living with chronic migraine. 30. One more thing I’d like to say about life with migraine is: It is still a life, just a different one from the one that I had expected. What I mean by this is that I have to be much more mindful of how I choose to spend the precious time when I am feeling well. I have given up on living a “normal” life and instead accepted the beauty of living to the fullest when I am able. Still, I continually seek to find strategies to increase the amount of time that I am feeling well.